When you’ve got a one-mile drop on your right-hand side, for three hours, you don’t want to slip. 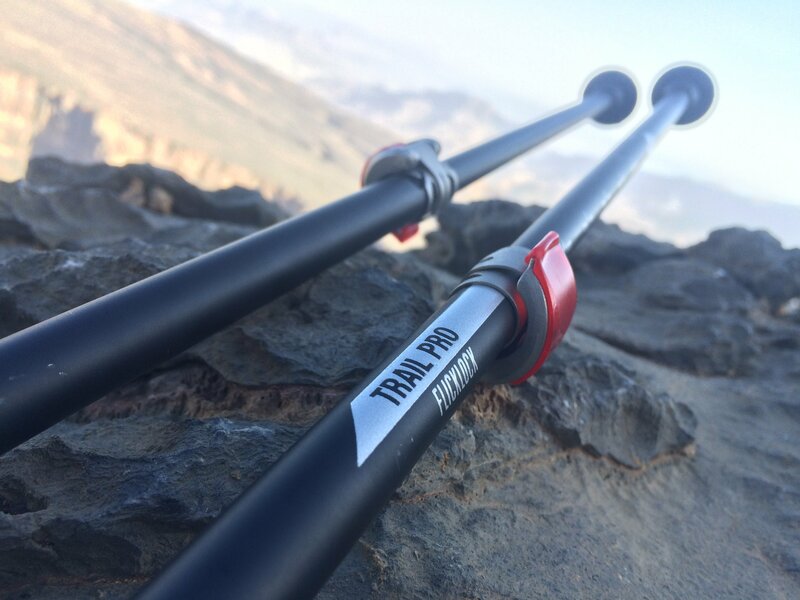 For TravGear’s fact-finding mission to Oman recently (fact: there are many goats in Oman) we took Black Diamond’s standard, adjustable, unisex size Trail Pro walking poles to the country’s precipitous Jebel Shams region for some life-saving stability. One problem: walking poles on a plane? OK, so we did check-in some (awesome) luggage for this trip – against our better judgement – but still didn’t have much room to play with. Happily, walking poles are now super-light and foldable, and the latest designs are ideal for travel – and that includes the Black Diamond Trail Pro, which packed down to 63 cm/25 inches no trouble. Incidentally, together they weigh 520g. When unfurled at the vast mountain landscape and irresistible canyon at Jebel Shams, we raised the Black Diamond Trail Pro to the correct length initially for flat terrain, aiming to set the pole at a length that allowed our forearm to be parallel with the ground while gripping the pole (with elbows tucked in, and tips pointing just behind us). For alterations for ascent and descent, the FlickLock Pro system of stainless steel fasteners really helped; the clasp snapped back softly yet firmly, and it 100% clamps the pole when released. No snags, no injuries, no loosening. Really dependable – and with a mile-drop just yards away, that was reassuring. As well as being quick to set-up and adjust, the lightweight Trail Pro poles proved stable and sturdy on all types of terrain, including loose rock and scree. Although a few previous (and pole-less) hikes that month had left me feeling weary half-way round, using the poles definitely lessened the impact on my knees. Although the handles are soft yet easy to grip, I was left with sore fingers by the end of the first few miles, so switched to using cycling gloves. However, this is more a matter of being used to it – like wearing a new pair of shoes. Offering plenty of stability and propulsion, the super-light carbon Trail Pro poles are high quality and easy to stow, and their FlickLock Pro system makes them easy to set-up and adjust securely. Perfect for vacations featuring the occasional trek.